DYO is a local co-op puzzle platformer for two players. Play as two minotaurs trapped in a maze. Merge your split-screens to find new ways to traverse each level. The game is made by Team DYO. 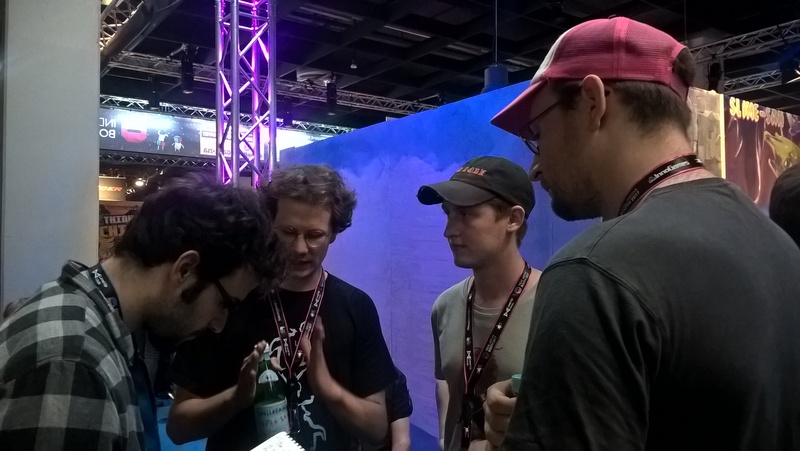 In the Indie Arena Booth, during Gamescom 2017, DYO was showcased as well and we managed to find Max, Fabi and Raguar to talk to, so that we can learn more about the game and the studio behind it. The developers told us that the studio started when they met during their game design studies. The goal was to make local multiplayer games since they loved those kind of games. DYO is a two player platformer game with a very unique mechanic. The mechanic is hard to explain in words but if I were to give it a try, I would say it has to do with having the splitscreen having a couple gimmicks that help with solving various platforming puzzle in the game (things like having one of the two screen fixed or being able to cross over the split-screen). The game is almost ready and it is planned to release on Steam sometime near the end of the year. From December onwards, the studio says they will be looking at porting the game to consoles. Take a look at the game’s Facebook and Twitter for more.